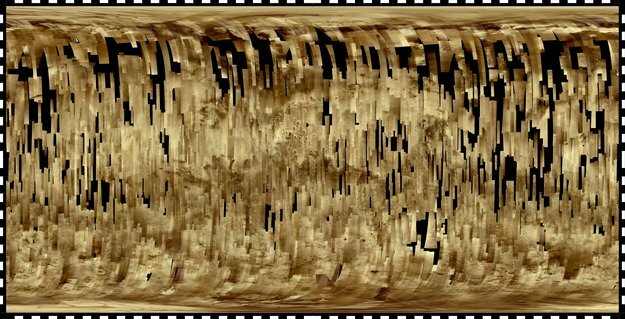 Earlier this month the the ESA made an astounding revelation: their Mars Express Orbiter's High Resolution Stereo Camera (HRSC) has successfully mapped nearly 90% of Mars' surface! Thus far 87.8% of the surface has been imaged, with 61.5% being imaged at a resolution of 20m per pixel or better. Mars Express was launched just ten years ago this June, making this feat even more remarkable. The below map is a mosaic of 2702 individual images showing the entire Martian globe. The latest image was taken on the orbiter's 10,821st orbit of Mars, which took place on 20 June 2012 orbit. This map does not include areas that were particularly affected by dust and/or atmospheric distortions; these areas are shown in black. Click to see the ESA's caption for this photo. From there you can download the high resolution version. The slight change in color tones is primarily due to changes in Mars Express' solar elevation, but can also be attributed to variations in dust content in different parts of the atmosphere. I encourage you to go to the ESA's website (just click the above image) and download their high resolution version! Once you do that, try and find some of the more prominent features on Mars, like Olympus Mons (top left) and the Tharsis Trio (below Olympus Mons and to the right), or Valles Marineris (further right of the Tharsis Trio). See All Images of Mars Showcased by Mars Travel!